Between emails, phone calls, projects, meetings, deadlines and more, management positions come with an added set of stress and pressure than a lower-level position would. Work in and of itself, despite the position, can be incredibly stressful alongside family, health, social, and financial concerns. For many of us, these challenges can send us into a mode of “autopilot”, in which we are constantly going, unable to stop and breathe for a moment. If you can relate to this, it’s important to slow yourself down so that your mental health can be a top priority. Not doing this could lead to the development of a mental illness over time – which, consequently, could have a direct impact on your work, home, and social life. Oprah Winfrey, Chairwoman and CEO of Harpo Productions, Inc.
A 2014 article published in the Journal of Leadership Education sought to promote a guided meditation methodology to assist leaders in promoting their well-being – a key component to effectiveness, productivity, and fostering quality relationships within the workplace. Researchers emphasized the beneficence in attending a meditation workshop so that leaders can develop practical tools that will not take much time throughout their day. Guided meditation in particular is a process by which individuals meditate to a text, recording, video, or person as they take them on a journey towards a grounded mindset. 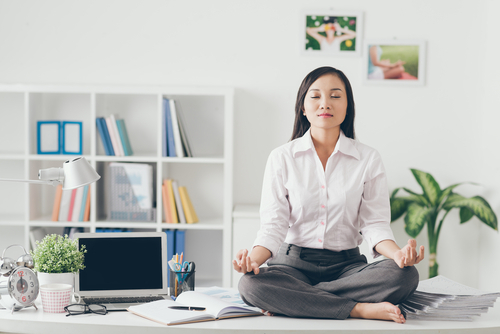 Amidst a busy day, leaders may find that guided meditation provides them with the structure and time-limitation that they need to take a mental health break while still being able to get right back to work. Meditation exercises could range from 5 minutes to 1 hour long, depending on how much time a person has to complete it. By practicing meditation, you are placing your mental health as a top priority in your life – which will yield significant benefits in other areas of your life as well (including your work endeavors). If you haven’t already, speak with a professional from a reputable treatment center about programs that could suit your needs. Whether you’re currently struggling with a mental illness or an addiction, help is available. « Is It Possible To Over-Work in Attempt to Cope with Symptoms of a Mental Illness?